Here are the ladies looks who aced the 2016 US Open. The NYC tournament featured a number of ladies who stood out in neon hues and bold designs. These ladies showed up in their very best looks for the last major tournament of 2016. Angelique showed up in NYC ready to claim the #1 ranking that eluded her earlier in the summer. The 2016 US Open champion, Olympic silver medalist, Australian Open champion, and Wimbledon runner-up, had a stand-out year and stood out under NYC's bright lights. 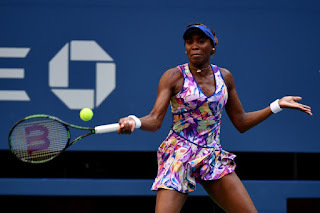 Venus designed a great kit for her 18th US Open run. She was defeated in the Round of 16, but was able to showcase her evolving style for 4 rounds in NYC. Looking forward to seeing what Eleven by Venus design she'll be wearing at the 2017 US Open. Madison rocked Nike Court's neon look at the tournament. The 2016 Roland Garros champion had a short stint in NYC after being eliminated in the 2nd round. Garbine wore one of the more flattering Adidas by Stella McCartney kits which featured soft pastels in contrast to the neon which was prevalent on the court. The 2016 US Open runner up looked classic and cool as a cucumber over the fortnight in NYC. Karolina's ink suggests a wild-side and we look forward to see what she'll be sporting in 2017. Allison had an abbreviated 1-match stay at the US Open. However, her black and white accentuated with hot pink accessories made her standout under the lights of Arthur Ashe.